Dragging a sharp metallic blade down the side of your face is never going to be a smooth-run. Burning, irritation and even blood shed are all part of the learning curve when it comes to this grooming ritual. The pain inflicted is either due to the many contradictions out there that prevent people from knowing the truth about shaving, or simply because men the world over adamantly follow the outdated tips that have been passed down throughout their family’s generations. However, we’re here to put an end to this once and for all, and so, from prep to post-shave, this is the only way to ensure a nick-free complexion. It’s been proven that facial hair is as strong as copper wire, so it’s obvious that preparation is paramount if you want a smooth glide. 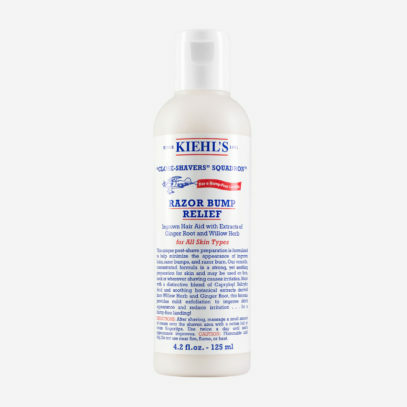 So, before you pick up your razor, use a gentle facial scrub in the shower or bath to exfoliate and soften hairs – not only will this make them easier to cut, but it’ll also rid of dead skin cells (and impurities) and open up your pores. You’ll soon find that resistance will be reduced dramatically. 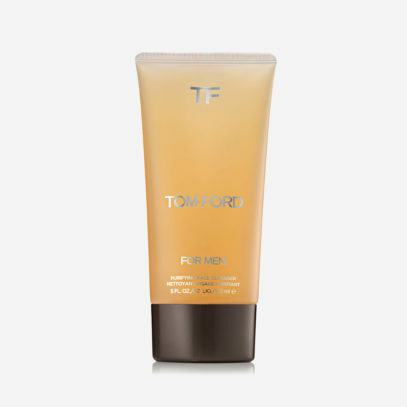 This cleanser by Tom Ford purifies and hydrates your face while keeping irritation to a minimal, while the Luna system by Foreo will – like an electric toothbrush – dislodge debris and dead skin via its sonic pulsations. The majority of men use foam or gel out of a can and rub it onto their face. 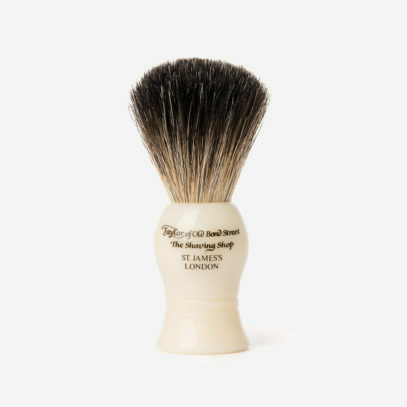 While there’s nothing wrong with this, our forbearers had more premium and luxurious tools at hand, namely the badger brush and shaving soap. 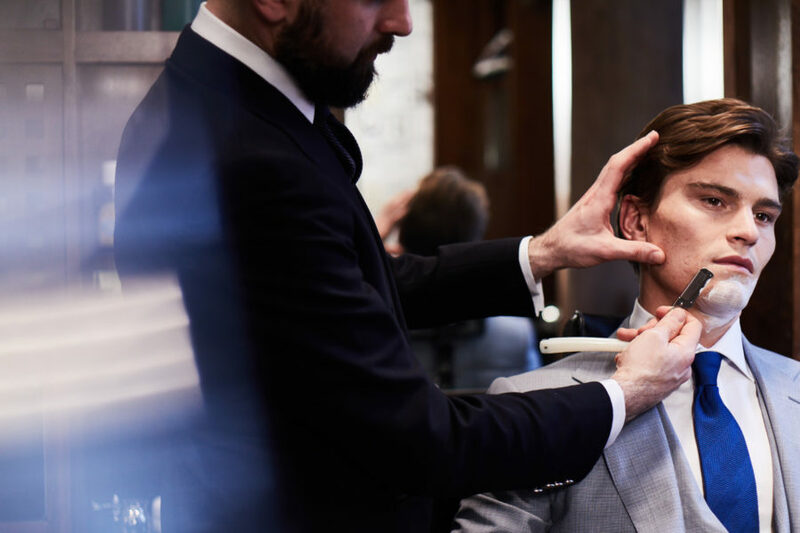 By using a brush (we’d recommend one by Taylor of Old Bond Street) you’re essentially making the hairs stand up, which will, in effect, give you more of a chance to obtain a cleaner cut. 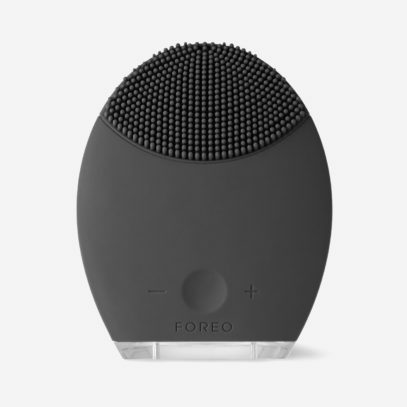 Using just your hands won’t give this level of stimulation (often it will simply leave hairs matted to the face), meaning that whatever product you use will be unable to penetrate the hair and soften it. In terms of consistency, the thicker the lather, the better, as this allows the razor to glide across the skin and reduce drag. 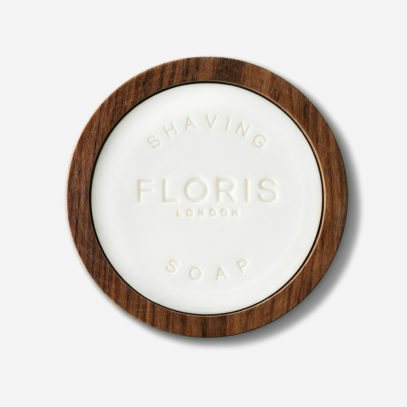 Something that already comes in a bowl will be ideal (preferably one by Floris as this will soothe any skin) to use with a shave brush, as you can mix the product up easily. Once you’ve whipped up a thick cream, start swirling it onto your face in circular motions (this will lift the hair), and when done, don’t reach for the blade immediately, but instead wait around two minutes for the stubble to soften. Despite conventional belief and ubiquitous advertising, you don’t need a multi-blade tool to give you a closer shave. Why? Because more blades mean more friction, which, if you hadn’t figured out already, results in inflamed skin. 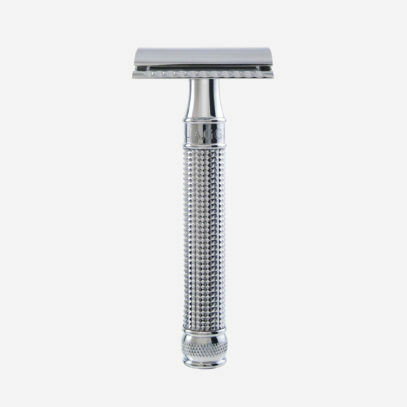 So, because you deserve to do your face a favour, ditch the disposables for a double-edged razor, because this one extremely-sharp blade won’t pull or drag your skin and will save you a lot of cash in the long-term (a pack of ten double-edged blades tend to cost less than £5). 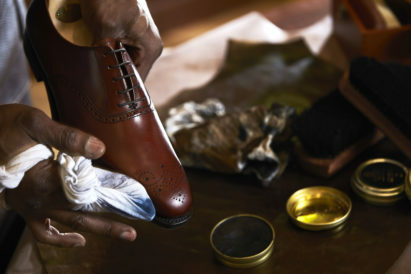 The modern man is always in a hurry to get somewhere, but when it comes to shaving, every gent should take his time. Why? Because doing otherwise will result in a cut or a day’s worth of redness. In general, hold the blade at a 30-degree angle from the face (if held too flat it’ll tear the stubble, and if held too steep it will ruin the skin) and start from the sideburns. 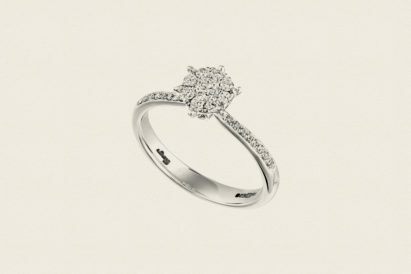 It’s important to take small, slow strokes and rinse with hot water after every swipe. 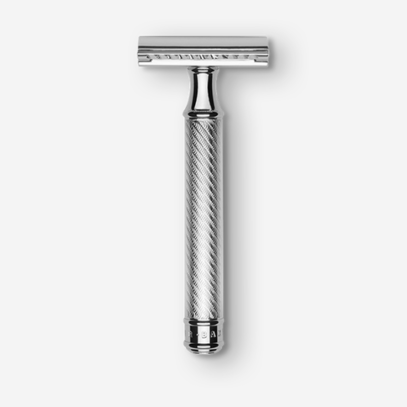 Also, to ensure an optimum shave, keep the skin taut by using your free hand to pull parts of your face flat. Against the grain or with the grain? As a rule of thumb, always with the grain as this causes less grazing. However, if you feel this is not getting you a close enough shave, then re-lather, making sure the hairs are soft, and go the opposite way. Every man’s hair grows in different directions (even in circles) so you have to find out what works best for you. 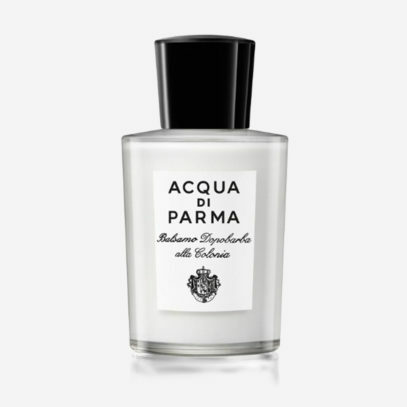 Immediately after you’ve finished, splash some cold water on your face to tighten up the pores, and then apply a post-shave balm, moisturiser or serum – after all, your top priority should involve reinvigorating the protective barrier that has just been sabotaged by your razor. 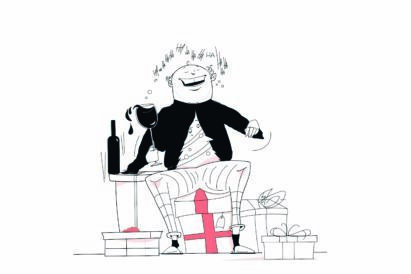 Avoid products with alcohol at all costs (this will dry out the skin and cause redness) and opt for something far gentler on the skin. Finally, make sure to pat it on instead of massaging because rubbing can often cause irritation.